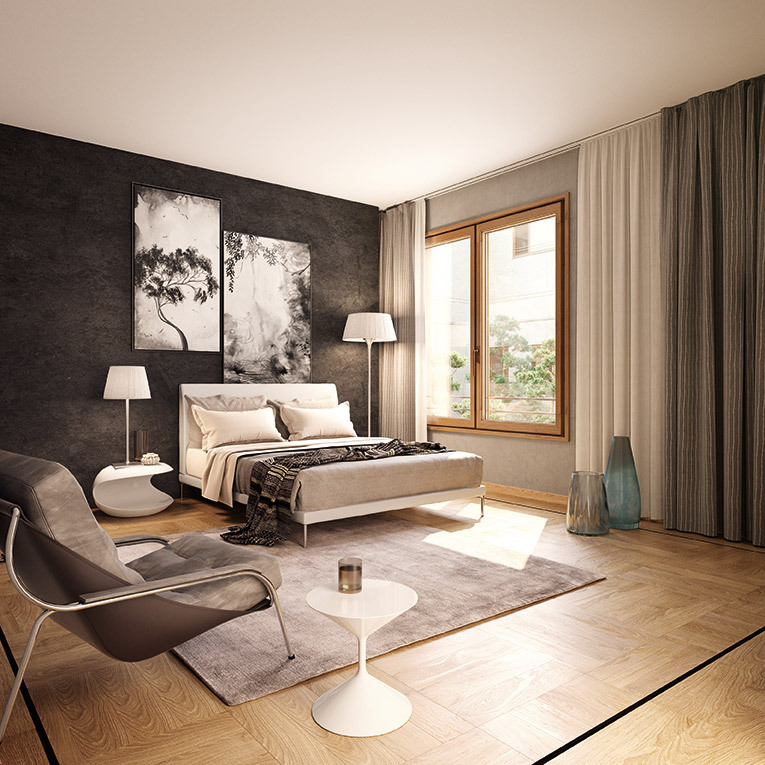 The historic townhouse was the inspiration for the elegant and spacious salon apartment in the Palais Varnhagen. Inspired by the 19th century „salon life“, it creates over its 182 m² the ideal setting for stylish social events and preserves with its simple partitioning the resident’s sense of privacy. The spacious presentation area provides just the right setting for any event and, together with the details designed by David Chipperfield, a unique living experience: ceiling-high doors with bronze handles, the recreated 19th century panel parquet flooring, and airy ceilings rising over 3 m endow the salon apartment with an inimitable flair. The generous bedrooms of the salon apartment exude comfort and a welcoming atmosphere. The floor heating under the high-quality floorboards creates a pleasant indoor climate and the private dressing area adjoining both bedrooms complements the elegant design of the bedrooms. The master bedroom’s en-suite bathroom underscores the exclusivity of the salon apartment. 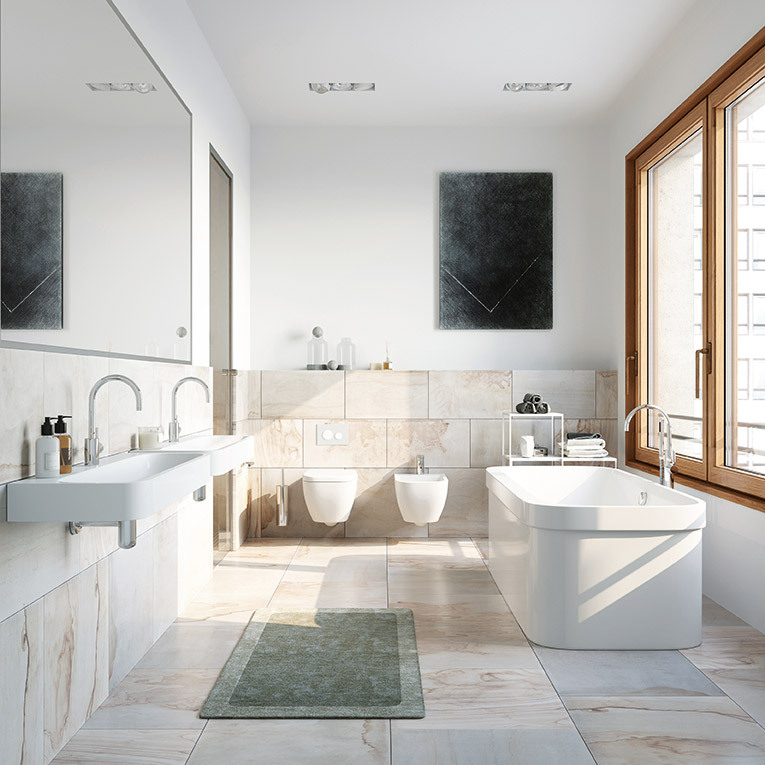 David Chipperfield has furnished the spacious master bathroom just as elegantly as the shower room and lavished it with high-quality materials. Walls and floors have been styled by the architect in light travertine, and he has designed the separate shower cubicles with contrasting mosaic tiles. Colour-coordinated, the bathrooms offer exclusive comfort in a welcoming atmosphere. High-quality, elegant, and timeless – just like the selection of materials chosen by David Chipperfield for the salon apartment in the Palais Varnhagen. Take his special floor concept, for example: faithful to the style of the historic townhouse, the salon preserves the large-sized panel parquet flooring with frieze edging, while the other rooms are adorned with harmoniously coordinated floorboards. Even the bathrooms blend seamlessly into the sophisticated design. Bright natural stone, contrasting mosaic tiles, and high-quality fittings characterise the elegant rooms. Modern solar control glazing and a video intercom system complete the high-quality furnishings of the salon apartment.